An asthma attack can be a frightening experience. The muscles around the airways inside the lungs contract in a bronchospasm. During an asthma attack, the airways become inflamed and clogged with a thick mucus, making breathing difficult. If you are experiencing any of these symptoms, you may be having an asthma attack. 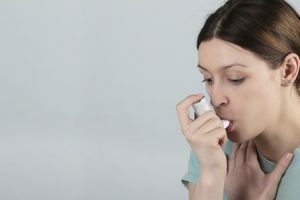 Rescue asthma inhalers may help restore the ability to breathe during an attack, but if symptoms are severe and if they don’t recede following the use of an inhaler, it may be necessary to seek medical intervention. Asthma has a variety of causes, some of which are not well understood. Exercise induced asthma is brought on by physical activity and may be made worse by cold or dry air. Occupational asthma is triggered by irritants in the workplace, like chemical fumes, gases or dust. Allergy in asthma is triggered by pollen, mold, spores, pet dander, or other airborne irritants. Severe asthma attacks can be life-threatening. A rapid worsening of an attack may be a sign that medical assistance is needed. If an attack doesn’t back off after using a rescue inhaler, if the victim can’t speak or breathe, or if unconsciousness occurs, seek medical attention immediately. Heeding off an asthma attack means knowing the triggers and the signs. Your doctor will work with you on a plan to track your symptoms, use preventative medications and treatments, and to avoid your triggers. Asthma can be difficult to live with but the symptoms can be controlled with a good management plan.